This past summer, Starbucks has announced its transition to using eco-friendly plastic lids instead of its typical green straws along with the flat lid. However, some Quinnipiac students are having a hard time committing to the new change and are still using straws. “Many students ask for straws even though our kids are updated to not need straws,” Radiant, an employee at Starbucks at Quinnipiac said. This began in July 2018 with lids just recently making an appearance at Quinnipiac. Starbucks estimates this change will help to eliminate more than 1 billion plastic straws per year, according to the Starbucks website. Quinnipiac Dining recently received an email from Starbucks about the new plastic lids. Soon after, the Starbucks at Quinnipiac began using the plastic lids. Despite the new plastic lids, there is still a container of straws available to students to take if they want one. On the other hand, some students are confused, thinking that the straws were supposed to be eliminated completely. An informal poll conducted on the Quinnipiac Chronicle’s Instagram, which 88 people responded to, gave students the option of straw or strawless. The survey showed that 43 percent of people (38 people) would choose the straw, and 57 percent of people (50 people) would choose no straw. “I’m all for saving the environment I love the turtles, but I think I’m gonna invest in a reusable straw because I can’t walk and drink at the same time without spilling on myself, but I think that’s more of a me problem than a lid problem. So all in all I’m down for the lids if it helps with the environment,” freshman biology major Alyssa Nelson said. Students really do believe getting rid of the straws will save the environment and be better for Quinnipiac. “I feel like it’s easier to drink now and it’s better for the environment- a win win for me and my PSL,” freshman communications major Shannon Flaherty said. Although students have mixed reactions, Starbucks is sticking to going environmentally friendly. “Starbucks estimates this change will help to eliminate more than 1 billion plastic straws globally per year, most of which ends up in landfills and the ocean,” according to Forbes website. This is a big deal for the animals living in the sea, according to an article by Forbes. “The impact on sea life has been immense. Research has found that 70 percent of seabirds and 30 percent of sea turtles have some amount of plastic in their systems,” according to NBC news, official website. Not only do straws affect marine life in the ocean, but other animals as well. With just Starbucks eliminating its straws, there will be a huge impact on the environment and even in the seafood we eat. This will also have an effect on the Quinnipiac environment. A big issue is also that single use straws are not recycled, they are thrown out with the rest of the drink causing the pollution in general. 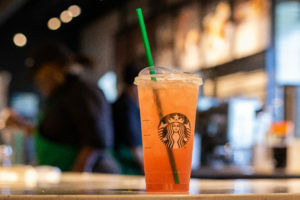 According to Clepper, many people believe the elimination of the Starbucks straws will just affect the environment, but it will also affect our world economically, having less toxic trash will help spend less money on trying to clean up all of this waste. For all of the straw lovers out there, there will be an alternative option coming out soon instead of the new lids. “Starbucks will begin offering straws made from alternative materials – including paper or compostable plastic–for Frappuccino® blended beverages, and available by request for customers who prefer or need a straw,” according to Starbucks, official site. “Hopefully students can learn that while many of the plastic items that we use in our daily lives may be convenient in the short term, they are very harmful to the world we live in in the long term,” Clepper said.